This movie masquerades under the guise of woman-driven horror movie, but the reality, as they say, cannot be farther from the truth. 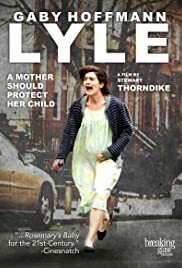 This clumsily shot film centers around a main character, a pregnant lesbian woman, who loses her toddler when said toddler falls out a window. She then spirals downward into deepening insanity as she is determined to protect her unborn child from everything and everyone, and everyone, she thinks, is out to get her. It sounds like a fair premise, but the way it is told is very poorly done. The story is dull, hold no rhythm, and makes no sense. There is no rhyme or reason to her thought process or actions; even insanity must give some kind of twisted reason, but in this movie there is none of that. It tries to go into a five minute introduction to perhaps some kind of supernatural deal with the devil, but without explanation or further study it becomes pointless and confuses the viewer. As a horror movie, Lyle fails in a spectacular fashion. There are no scares, at all. There are no jump scares, no psychological thrill, and, perhaps worse of all, not even a single tense moment. The boring camera views and bleak colors do nothing to help this movie either. I am sad I wasted my time viewing this during free time better spent on virtually anything else. I would not give a single dollar to their next movie if this is the best they have to show for their lazy, half-baked efforts.